This project was created on 05/17/2017 and last updated a year ago. Makers/Hackers: RF signal generators are expensive pieces of test equipment typically only accessible by pro engineers. ERASynth removes the cost barriers and makes quality RF signal synthesis accessible to everyone, especially budget-conscious makers. Students: ERASynth is for everyone who wants to learn how signal generators work. Since it is open source with open schematics, students or anyone who is curious about the inner details of signal synthesis can learn from ERASynth. Professionals: Professional engineers will find ERASynth is a very good alternative to many of their existing signal generators. Professors/Researchers/Start-ups: With all the cuts in research funds, who can afford to spend tens of thousands on signal generators? While fractional-N PLLs are great for generating frequencies with fine frequency resolution, they suffer from a phenomenon called “integer boundary spurs” (IB spurs). The control GUI is purely web-based (thanks to ESP8266), hence we will not provide any app for ERASynth. There are several reasons for that. Firstly, web GUI is platform independent. Secondly, it is more reasonable to support one web app instead of so many apps on different platforms. Lastly, the web GUI is very responsive and mimics apps very closely. It is almost like an app, looks and feels like an app. We are happy to announce that our first batch of ERASynths were nicely packaged and shipped from İstanbul to Crowd Supply’s warehouse. There are extra units. So, ERASynths are now in-stock. The order can be made and the shipment will be done immediately. We’ve finally added FM functionality to ERASynth. When it comes to microwave synthesizers, there are several ways of implementing analog modulation functions. These are very nicely outlined in the article “Implementing Modulation Functions in Microwave Frequency Synthesizers” by Chenakin. During the past week, It has explored different methods of FM signal generation. Please watch the following video for a quick demo. We also show the “Diagnostics” feature of ERASynth in the video. We selected Arduino Due for ERASynth for a number of reasons: Its processing power, number of available hard SPI LE pins, availability of a many GPIO pins, and its natural integration with the ubiquitous Wi-Fi module ESP8266. When we started the design of ERASynth, we could use any of the many open source projects for the control of our signal generator project. We evaluated our options and realized Arduino Due had the enough horsepower to support all of the calculations. CPU power was an important metric for us, because we had set out to create an agile signal generator. When you are aiming to achieve frequency-switching speeds under 100 µs, you do not have a lot to waste on the calculations. With its 84MHz ATSAM3XE, Arduino Due was the perfect choice for ERASynth. As you can see in the figure above, one frequency change command requires 16 bytes of SPI transaction. We were able send 16 bytes in less than 30 µs. Wideband and high dynamic range RF circuits utilize many control elements such as switches and attenuators to provide the wide bandwidth and dynamic range. In the design of ERASynth, there are multiple switches and several attenuators requiring more than 20 GPIO pins. Luckily, Arduino Due provides more than enough GPIO pins. One of the defining features of ERASynth is its Wi-Fi connectivity thanks to the on-board Wi-Fi module ESP8266. Before starting the design of ERASynth, we did not have any prior experience in using ESP8266. We were able to get started quickly as there were lots of code available. Arduino made our job very simple. Getting ESP8266 into action was just a matter of loading a new library. Using Arduino IDE, we can program ESP8266’s flash without even opening the ERASynth enclosure. We are using the same mini-USB port to program both ATSAM3XE’s flash and ESP8266’s flash. This was all possible thanks to strong community behind Arduino and ESP8266. Programming ESP8266 using the Arduino IDE is not a trivial achievement considering Dave Jones published a video for it just recently. As we mentioned in the previous updates, we are going to use LMX2594 in our final prototype. TI has just released the LMX2594 a few months ago. There is a relative small risk in using a newly released IC in the design. We wanted to mitigate that risk. We ordered two copies of the eval board (LMX2594EVM) and gathered a test setup to mimic ERASynth’s architecture. We needed two copies because ERASynth’s design uses one PLL for the reference generation loop and another PLL for the main synthesizer. We drove one LMX2594 with another LMX2594 for ultra-low spurious. As the block diagram shows above, PFD comparison frequency of ERASynth’s main loop will be around 270 MHz in the final prototype. This is a relatively high comparison frequency but LMX2594 can do it. In integer-N mode, LMX2594’s PFD rate can be set up to 400 MHz but there is a limit on the N divider (N ≥ 28), that is why we selected PFD rate as ~270 MHz. 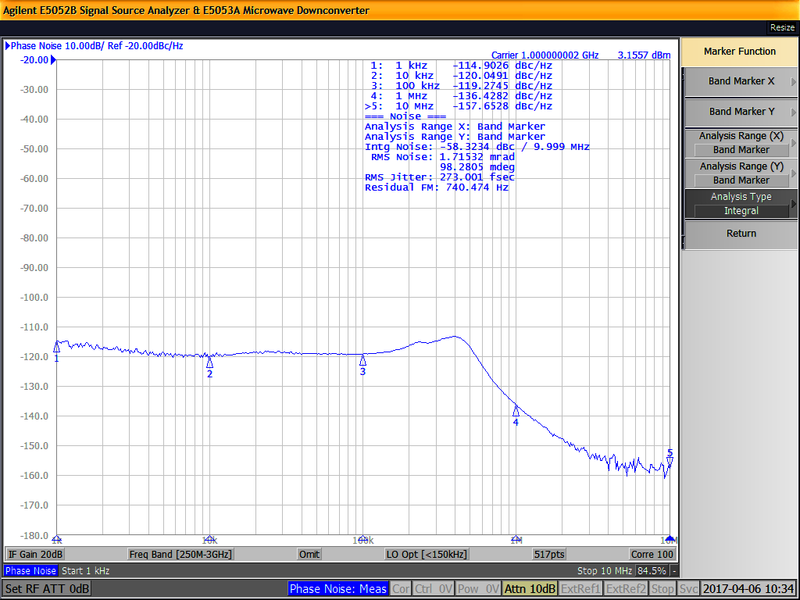 We measured a phase noise of -112.7 dB at 3 GHz, 10 kHz offset using our PSA spectrum analyzer. This value is a couple of dBs higher that what we were expecting. Obviously, there is some (about 3 dB) phase noise contribution from PSA’s tuning local oscillator. For exact measurement of such a low phase noise, we would need a signal source analyzer (SSA), which is a very expensive test gear. We took the phase noise graph shown in our campaign page with an SSA (courtesy of İTÜ’s VSLI lab). We must say TI has done a great job in LMX2594. We went the extra mile in our second prototype just to get a phase noise of -120 dBc/Hz at 1 GHz. We had to drive ADF4356 with HMC830 while using LTC6945 as the external PFD. The people at the clock and synthesizers division of TI were able to squeeze even more performance into a single chip. What is more fascinating is that you can even feed this chip (LMX2594) with a switch-mode power supply. Using two LMX2594 eval boards, we were able to verify the performance of ERASynth’s final revision to the best capability of our test equipment. The harmonics stem from the signal generation mechanism and we cannot do much but use a lot filters if we want to reject them. ERASynth uses highly integrated PLL ICs that have built-in VCOs. These types of ICs usually contain an octave VCO in the GHz range and generate the lower frequencies by dividing the fundamental VCO down. For example, our second revision used ADF4356 by Analog Devices. ADF4356 has a fundamental VCO range of 3.4 to 6.8 GHz. Frequencies below 3.4 GHz are generated by utilizing digital dividers, which produce square-like waveforms. Bench top equipment also generate low frequencies by using digital dividers, but they also provide a lot of filtering by using switched filter banks after the dividers. Switched filter banks are expensive and bulky. In fact, a filter bank to improve the harmonics level of ERASynth to bench-top levels would probably cost more than several times ERASynth itself. You cannot improve phase noise (at close offsets) using an external filter but you can improve harmonics. Harmonics can be easily rejected with external filters. Many RF people have a variety of connectorized filters (usually by Mini-circuits) in their labs. When there is a test requiring stringent harmonic rejection levels, they use external filters (even with bench-top equipment). For example if you want to measure SFDR of a high resolution ADC (>12 bits), you have to use an external filter to make sure that measurement is not limited by the signal generator. That is the reason why some bench-top equipment manufacturers provide options for enhanced harmonic rejection. For example, option E8257D-1EH by Keysight improves the E8257D’s harmonics by more than 25 dB. But it costs $5304. It would only be fair if we compared ERASynth to competitors in its own league. Many of our competitors utilize ADF5355 or equivalent PLL ICs to go up to 13.6 GHz in frequency. Since the signal generation mechanism is the same, we believe competitor harmonic levels are comparable to ERASynth. However, when it comes to sub-harmonics, ERASynth’s final revision will surpass competitors. We are using LMX2594 by Texas Instruments in ERASynth’s final revision. LMX2594’s fundamental VCO range is 7.5 to 15 GHz. Unlike competitors, we do not need any doublers to generate the upper frequencies. Contrary to harmonics, subharmonics may cause problems. Lastly, harmonics are not always a bad thing. They are even helpful in some situations. For example, when driving a mixer, the more square-wave-like LO is, the lower the mixer’s noise figure. When driving an ADC or DAC as a clock source, the more square-wave-like the clock is, the better the slew rate. The better the slew rate, the better the jitter is. The better the jitter, the better the ADC or DAC is. A signal generator’s pedestal phase noise has different impacts on the system depending on the application. For example, when used as a local oscillator in a receiver application, pedestal phase noise degrades the receiver sensitivity. When used as a clock source in a data converter, pedestal phase noise (together with close-in phase noise) determines the jitter, which ultimately effects the converters dynamic performance. The graph above is obtained using this setup. It has been developed a search algorithm for finding the optimal attenuator settings for a given power level. It is used U2001A USB power-meter by Agilent for calibrating the prototype. This power-meter works from 10MHz to 6GHz and measures power levels between -60 to +20 dBm. We have ordered a new power-meter that will measure up to 26.5 GHz, it is on its way to Turkey. Once we get our new power-meter, we will be able to calibration beyond 6 GHz. 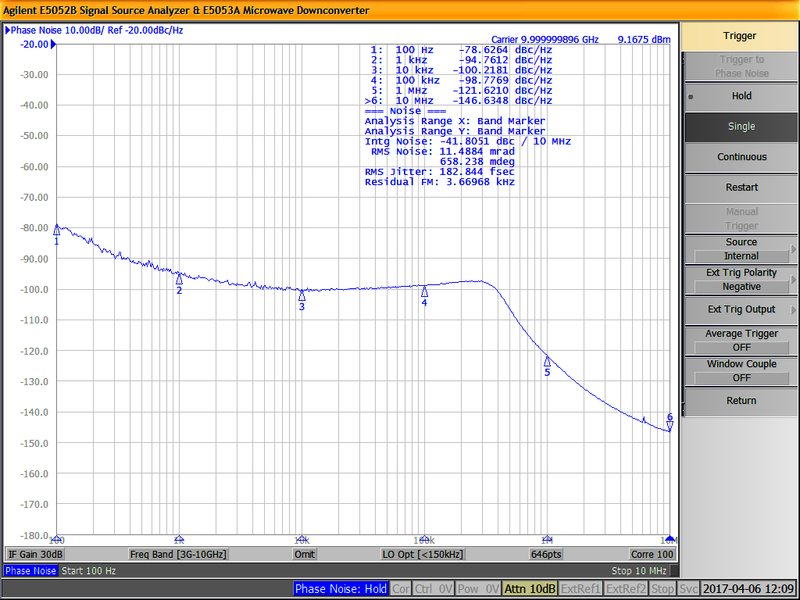 After the calibration, amplitude uncertainty is below 0.5 dB and setting resolution is 0.1 dB. We also show a quick demo of REF input, showing a 1 GHz signal move on the spectrum analyzer when REF input is switched between internal and external. We received some questions regarding the WLAN signals coupling to the RF output. Some people were concerned that phase noise would increase with WLAN module (ESP8266) active. Our tests show that there is no need to worry about WLAN. First of all, whether you use the on-board WLAN or not, WLAN signals are all around us. Secondly, we have taken very serious measures to cope with all kinds of couplings and leakages on the board. As you can see in the detailed PCB picture on the campaign page, ERASynth PCB is partitioned to protect sensitive areas from the outside world and from the other noisy areas on the board itself (such as switch-mode regulators, MCU etc…). There is a tremendous amount of filtering on every supply and control line. The picture below shows ERASynth’s RF output connected to a spectrum analyzer while the WLAN module is activated. As you can clearly see in the picture above, on-board WLAN signals are suppressed more than enough. With that said, if you are still uncomfortable with the WLAN interface, you can disable it completely using the serial interface. ERASynth&apos;s web GUI is almost complete. We had some problems with the WLAN module ESP8266. For some reason, the server on ESP8266 was too slow with some of the browsers. It was very fast on IE/Edge and very slow on Firefox and Chrome. Similar issues have been observed by other users of ESP8266 in the open source community. We had to debug this issue for a long time, now the web GUI is incredibly fast as you will see in the demo video below. It is almost an app, it feels like an app. Actually it is better because it works on all modern web browsers. Hi, very interesting project for sure. By the way there is nothing said about the resolution... What about it ? You are about to report the project "ERASynth", please tell us the reason.